faster without spending your valuable time traveling. The Daytona area and all of the Central Florida lakes and rivers have some of the best trophy largemouth bass and crappie fishing the world has to offer. In the world of bass fishing, there is a name synonymous with the great expectations of trophy bass fishing and big crappie. It has been immortalized in songs, written word, used in fishing reports and many have told stories of it. It is a legendary and probably the most famous river in the world for bass fishing…were talking about the fabled St. Johns River of Northeast Florida. Just minutes from the coast of Jacksonville, St Augustine and Daytona stretching nearly one-half of the length of Florida, the St. Johns River is mecca for bass fishermen everywhere. The fact that, year after year, it continuously produces unbelievable results, has led many to deem it as one of the best in Florida. And well the name fits! It is one of those rare bodies of water that produces both quantity and quality, along with never-ending expanses of breath-taking beauty. 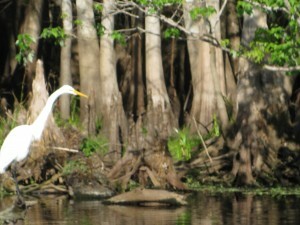 The 300+ miles of the St. Johns River are a study in diversity and fishing options. Whatever type of fishing water the you desire can readily be found along the banks of this river. And, as with any celebrity, this famous river has a character and series of personal traits all its own. It’s one of the only rivers that flow backwards, yes the St. Johns flows from South to North. Its headwaters, just to the South of the city of Melbourne, begin with the convergence of three canals which drain surrounding farm land. Before the canals were constructed, the natural drainage of that same large marsh area marked its beginning. From this point, which is slightly less than 20 feet above sea level, it starts its sluggish flow to the Atlantic Ocean at Jacksonville. The first lake located west of Daytona is Lake Wooduff with the best access to the St John River out of Dexter. Lake Monroe is the next lake going south on the river off of interstate I-4 and the closest location to Orlando on the river. Also directly west of the river is the Harris Chain of lakes, list of world class lakes in it’s self. 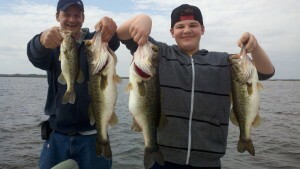 We service all of Central Florida lakes, over 3000 plus that have fantastic freshwater fishing.